One of the best parts of my quilt class is being able to use the design wall and wealth of knowledge of the teacher. I was struggling with the last row of this quilt trying to make it “fit” on the bottom. It just wasn’t working no matter what I was trying. I took my quilt in with the pieces made and the teacher suggested putting the last row on the top instead of the bottom. Why did I not think of that? Such an easy fix to a major design problem I was having! The quilt top is together and now I need to pick out some borders and a backing fabric next class. 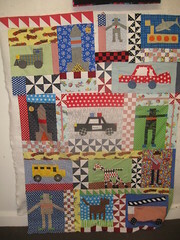 Over the summer I am going to have plenty of hand quilting to finish the girl version of this quilt and this one. The move went as well as could be expected. We are in the new house which is about 80% done. We are so close, but so far too. Hoping to see some major progress over the next few weeks before Christmas creeps up. I just ordered my Christmas cards. Can you believe it is coming up so soon? I need to get cracking on some sewing!